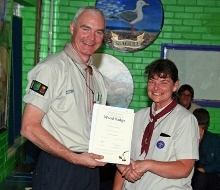 Oh Dear - I have just realised that it is 3 months since we last issued an edition of The Woggle. This is not because we have not been up to anything. Congratulations to Cameron Simpson, Jack Capaldi-Tallon and Dominic Thompson on receiving their top awards from Ian Stott, the District Commissioner for Havant. Over 400 Nights Camping in 2 Months. During the month of May, all 3 Cub Packs spent consecutive weekends in camp, (a total of 178 nights) whilst at the end of May, Shark Troop held a weeks camp in East Sussex (182 nights). At the beginning of June, 9 Explorers completed a 3 day expedition for their Chief Scout's Diamond and Duke of Edinburgh Silver Awards (18 nights) and two weeks later 30 Scouts from Eagle & Lion troops took part in the District Camping Competition (60 nights). Well done to the Scouts, Leaders and Parents who completed the full 15 miles of the Langstone Walk organised by the Lions Club of Hayling towing 3 Trek Carts for fun! 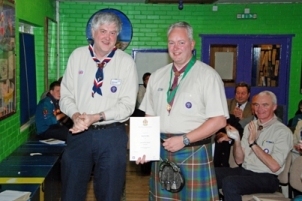 Jim Simpson, Leader of Lion Scout Troop was surprised to be called to the front at our Annual Awards evening recently. 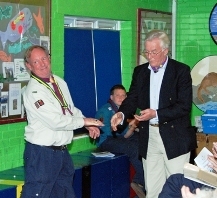 Jim was summoned by Adam Jollans the County Commissioner for Scouting in Hampshire and was then presented with the Medal of Merit, presented to Leaders in Scouting who make an outstanding contribution over many years. Congratulations Jim for receiving this deserved recognition. You can find out what other awards were made at this meeting, later in this newsletter. Over 300 adults plus many, many children came along to our latest book sale, with takings on the day over £750. Once the costs are taken off and sales made prior to the day are included, the total profit was over £900 - an amazing and record result. Thank you to Phil Blosse and all of the teams that helped with the sorting, pre-sales, loading, unloading and help on the day who have all made a significant contribution to our funds. Thank you to everyone who supported our Race Night and raised £300 for our World Scout Jamboree and Denmark expedition Scouts and Explorers. 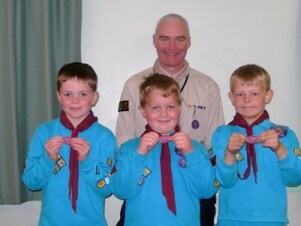 The evening was organised by the Scouts / Explorers with support from their parents, Ian Hawke and Mike Hamson. Congratulations to Jan Randall, Michael Blosse & Linda Hunter (April) and Jenny Diment, Tony Fleming and Richard Thomas (May) who each won £25 in our 100 club draw. Over 100 people crammed into the HQ for this annual review of what we have done and to see illustrated talks from the Scouts and Explorers. 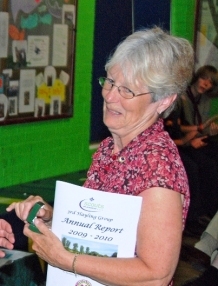 Having got the formalities out of the way, including a review of our Family Camp in 2009, a number of special awards were made. Wood Badge for Andrea & Fiona - The Wood Badge is the emblem presented on the completion of Leader Training. Ian Stott, District Commissioner for Havant presented Andrea Heath (Jupiter Pack Leader) and Fiona Jordan-Harrison (Aspen Beaver Leader) with their awards. The Fred Rook award is presented annually to a member of the group who makes a significant contribution to the community. This year the award was presented to Zack Allgood by Fred Rook. The David Baker Award is presented to the uniformed member of the group who best demonstrates their commitment to our Law and Promise. This year Oliver Tonkin received this award from Jane Baker. 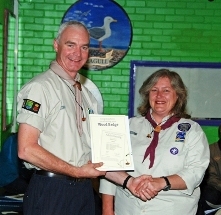 Ian Hawke then presented two "Thanks Badges" to Marilyn Skennerton and Paul Fisher for their support of Hayling Scouts over many years. Ian Stott presented a 5 year Service Award to Clive Allgood, a member of our Development Team and the 40 years Service Award to Ian Hawke. Barnabas Pycroft and Rosemary Harrison then gave an illustrated talk on the Explorer expedition to Switzerland. Oliver Tonkin, Scott Hickman and Ed Harrison then gave a presentation on their cycle camp around the Normandy Beaches last Summer. Finally, Michael, Matthew, Jack and Scott would like to thank everyone for buying raffle tickets throughout the evening, raising over £100 for their Jamboree Fund.